This one of the creative Choux pastry bakes that I had in mind and couldn't wait to use up the excess egg yolks in preparation for a macaron bake! Turtle cream puffs filled with Matcha custard and topped with Matcha Craquelin! 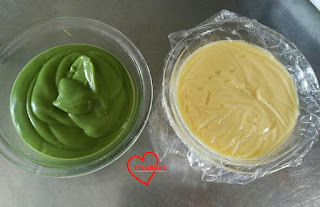 And I just have to take a close up photo of the smooth and creamy Matcha custard! Crisp outer shell and smooth, creamy insides full of Matcha goodness. Yums! My elder kid who is not a fan of cream puffs loved this pastry and wished there were more! 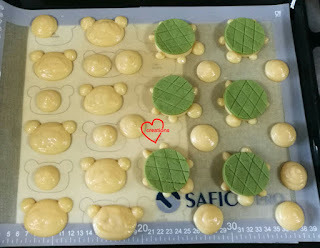 I sold most of it to a friend, along with some Rilakkuma vanilla custard cream puffs (will post in the future). This is the first sale I am making for creative choux pastry so I am excited about opening up another avenue of cute and creative bakes! I am still testing out various recipes to see what I would like to use as a long term default. 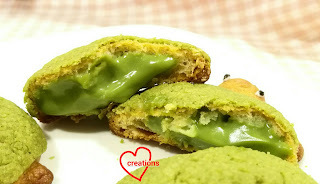 I adapted the recipe for Choux pastry case and matcha custard (pastry cream) from Little Miss Bento, and the recipe for Matcha Craquelin from here. I didn't follow exactly the ingredient portions and method from the sources. 1. Whisk together egg yolks, cornflour, Matcha and sugar in a bowl. Set aside. 2. Heat milk in saucepan until boiling. Remove and pour into egg yolk mixture in a slow and steady stream while whisking the egg yolk mixture continuously. 3. Pour the mixture back into saucepan and heat over medium-low heat while whisking continuously. Keep an eye on the mixture as it will start to thicken suddenly. Take it off the heat to continue whisking if necessary to prevent the custard from becoming lumpy, then put it back on the heat again. Keep heating and whisking until consistency is like smooth curd. 4. Remove from heat and stir in butter and vanilla. Sieve the custard into another bowl and place a cling wrap over the surface, touching the custard. This is to prevent a skin from forming. Refrigerate until ready to fill the Choux pastry cases. 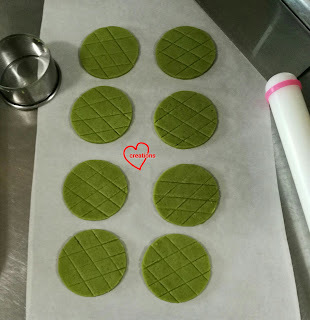 I made Matcha and plain pastry cream. I love the smoothness of the cream! This recipe is similar to the recipe I used previously but this one has more butter, salt and sugar. * You may use either bread or plain flour only. Bread flour makes the pastry more crispy and stronger in structure but plain flour gives it a more delicate bite. 1. Prepare the Craquelin first. Cream butter and sugar in a mixing bowl until pale. 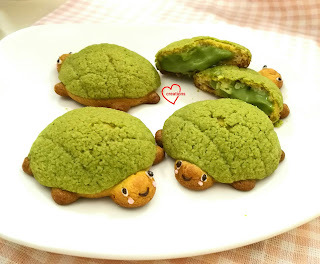 Add sifted flour, salt and Matcha powder. Mix well with a spatula until a ball of dough forms. Roll between two baking sheets until thin, about 2-3mm thickness. Freeze the dough until firm (about 15 min). Use a round cookie cutter to cut out disks and place on another baking sheet to freeze until ready to use. 2. Use the same round cookie cutter to trace out circles on a baking sheet. Make sure that there is at least 3-4cm between the circles. 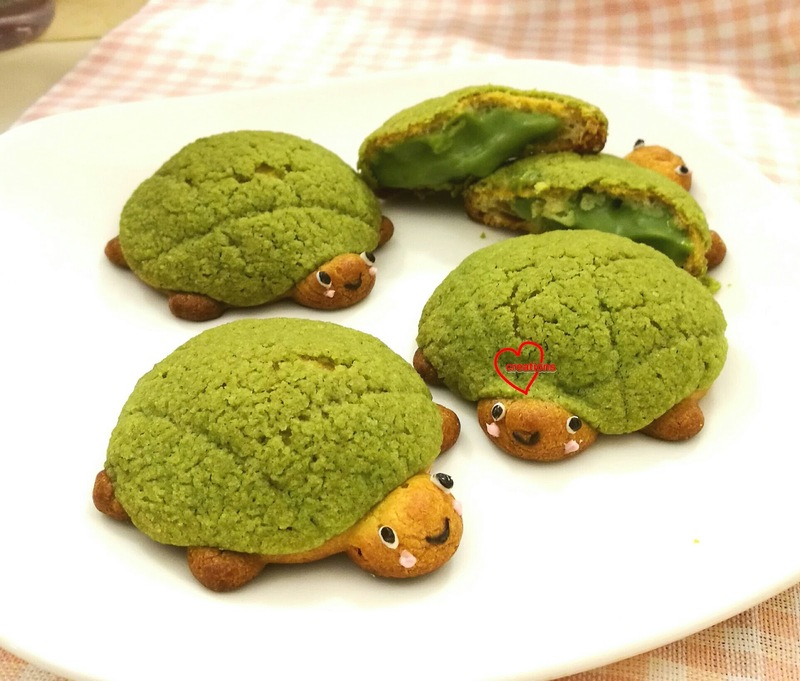 That will be the body of the turtle. Place the baking sheet under a silicone mat non your baking tray. You may just use baking sheet if you don't have a silicone mat. 3. Preheat oven to 180℃. 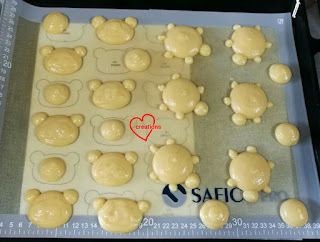 Prepare the Choux pastry case. Place water, milk, salt and sugar in saucepan. Bring to a boil while stirring constantly. Once it reaches a roiling boil, pour mixture into the flour. 3. Use wooden spoon or spatula to mix well until a ball of dough forms. Return to saucepan and continue to stir over low heat for 2-3 minutes to cook the dough. Do not brown the dough. Remove from heat and let it cool for about 10 minutes. 4. Add egg a little at a time and mix well with each addition. Towards the end, test the consistency. It should fall off the spatula slowly and leave a streak that doesn't collapse on itself in the batter. 5. Transfer batter into piping bag with a hole cut at the end. Pipe circles according to the template drawn. Pipe the head, legs and tail. Use a finger wet with water to tap down any peaks, especially the small piped parts. 6. Remove the frozen cookie dough from the freezer and gently place each one on top of the turtle. Pierce the pastry case with a skewer to release any steam. Cool completely before decorating. Melt some dark and white compound chocolate with a bit of vegetable shortening. Pipe or paint on the face with a toothpick. Fill a piping bag fitted with a small piping tip (about 2-3mm) with Matcha pastry cream. Poke a hole in the pastry case and fill with the pastry cream. Keep refrigerated. Best eaten fresh!